Back in April, in the protective warmth of the greenhouse, the red cabbage seedlings germinated. I sowed many more than I needed but hoped that I would be able to sell the surplus seedlings at a plant sale I would be attending the following month. As it turned out, red cabbages were not a huge hit with the people who visited the sale and I didn't sell a single one. As a consequence, I have a more than adequate supply of red cabbages becoming ready to pick. The rabbits have nibbled on a few of them, but there are plenty left for us. Coleslaw has become a fairly regular part of our meals of late, but I was also keen to have a go at making sauerkraut with some of the surplus. About two weeks ago Mike and I set to, slicing cabbages and filling my largest stainless steel pan with the shredded pieces. We soon found that one head of cabbage makes an awful lot of cabbage shreds. Sauerkraut is easy to make. 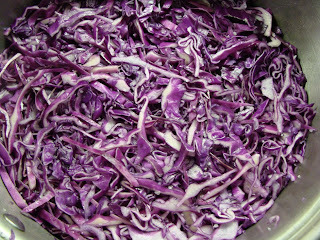 We added salt and a little water, weighed the cabbage down with a plate and let it ferment for 10 days or so. Today I packed the sauerkraut into jars. The colour of it is breath-taking. It tastes pretty good, too. 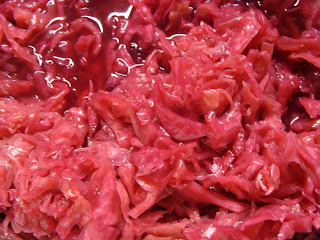 In writing this post I have learnt that sauerkraut was the principal food of the builders of the Great Wall of China. So I shall be expecting great things from myself and Mike in the weeks to come. Oh, I love sauerkraut. And I LOVE knowing that it was the principal food of those who built the Great Wall. My China-born daughters will be intrigued by this new fact. Thank you. And enjoy your crop. I have exactly three red cabbages coming on. Sigh. 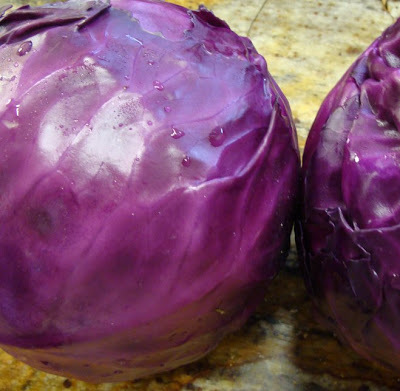 What gorgeous looking red cabbages. I had some lovely ones in the spring that were almost ready to be harvested but they all got devoured by what I thought were rabbits, but turned out to be my extremely greedy chocolate lab! Mo: I really laughed out loud at that comment. Our dog is half Labrador and pretty greedy, but not quite that bad! He did steal my one ripe melon last summer, though, for which he has not been forgiven. Mmm - love sauerkraut. It's very easy to find now in Scotland - every supermarket has it in the Polish food section! Never heard of the red variety - it gives it a gourmet air.